MyPetChicken.com has partnered with Storey Publishing to celebrate Chick Days. Every day of our Chick Day Eggstravaganza, MyPetChicken.com will be giving away a chicken-inspired gift! All you have to do to enter is write a short response to each giveaway post. We will pick one winner at random for each giveaway posted, and we will announce the week's winners on Fridays — be sure to check back to Inside Storey each day! 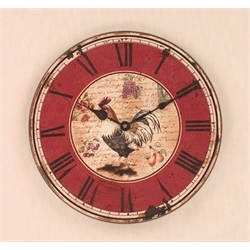 Today's giveaway is the Red Rooster Wall Clock. Let us know why you would like to win this gift, if you own chickens, or if you want to raise chickens; give us your favorite chicken or egg recipe or tell us a funny chicken story; or just say “hello.” But remember, you must post to be entered to win. We look forward to your responses! Happy Chick Days from your friends at Storey Publishing & MyPetChicken.com. What an adorable clock! You would think I have chickens with the amount of books and magazines I have on owning them. Not yet, but someday! Gorgeous clock - looking forward to all of your giveaways! I wanted to email you in regards in any possible advertising opportunities you may have with your website...I would be very interested in working something out with you if you have anything at the moment. I'm looking to earn support for a national cause and get visibility for the "plant 1 billion trees" project which Andrew Liveris and the Nature Conservancy have partnered up on for people to donate $1 to. Let me know if you would be interested at all in supporting this cause. I look forward to talking to you soon! Cool clock! I, too, raise Buckeyes, and love the breed. Nothing like chickens underfoot to get under your skin!